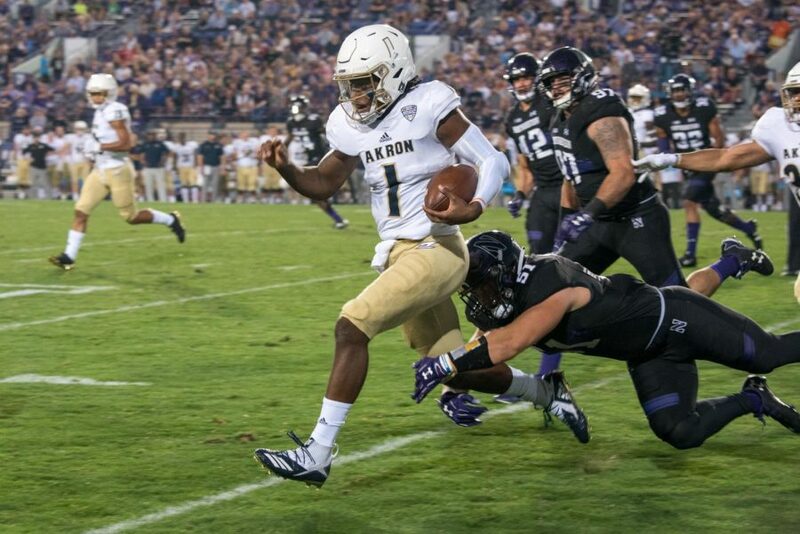 Akron quarterback Kato Nelson scampers away from Northwestern defenders. The loss dropped the Wildcats' nonconference record dating back to 2016 to 3-5. This past Saturday, Northwestern fell flat as 21-point favorites and imploded in the second half en route to a 39-34 loss to Akron, the program’s most embarrassing loss in a long time. Wait — scratch that. More like the program’s most embarrassing loss since … just two years ago, when FCS-level Illinois State came into Ryan Field and won 9-7. In 2016, NU dropped home heartbreakers to Western Michigan (22-21) and aforementioned Illinois State before rebounding with a 24-13 win over Duke; in 2017, the Cats topped Nevada 31-20 and blew out Bowling Green 49-7 but were demolished by the Blue Devils, 41-17; so far in 2018, NU has lost to Duke again (21-7) and then to Akron, with a daunting matchup against Notre Dame scheduled in November. The Akron and Illinois State defeats are inexcusable by any standard, and the Western Michigan loss would be humiliating any season other than 2016, when the Broncos entered the Cotton Bowl undefeated. Duke quarterback Daniel Jones has consistently looked Heisman-caliber against the Cats. Even Nevada, a team that ultimately went 3-9, led NU in the fourth quarter a season ago. So what gone so consistently yet horribly wrong in these early-season, nonconference games? Four factors stand out. Grousing about offensive line play is a seemingly yearly autumn tradition for the Cats’ faithful. Through the first six games of 2016, the unit ranked seventh-worst in the country in rushing opportunity rate, per Football Outsiders, and had also given up 17 sacks. A similar narrative was repeated during the first half of the 2017 season, when offensive line coach Adam Cushing described his group as “not consistent enough … not physical enough” after the first four games. The fact that the Cats’ O-line has undergone something of a rebuilding project during every single season of late means that, by default, they’ve struggled in such seasons’ early-going — when nonconference games occur. The Big Ten is known as a physical, conservative, rushing-oriented league and NU has predominantly — thanks to workhorse backs Justin Jackson and now Jeremy Larkin — lived up to that reputation. Yet in contradiction to that, the Cats have actually averaged only 3.3 yards per carry in nonconference games over the past three seasons, a significant difference from their 4.1-yard average in conference battles. That’s presumably a much bigger indictment of the offensive line than the running backs, and that trend has continued in 2018. Linemen Blake Hance and Rashawn Slater were both injured during the Duke game; Hance and Tommy Doles missed the Akron game. Those injury woes have equated to high turnover and reduced effectiveness. With offensive line struggles reducing the run game’s efficiency, NU has looked to attack nonconference defenses through the air more than they have Big Ten defenses. In the eight nonconference games since the start of the 2016 campaign, the Cats have passed on 52.5 percent of plays, as opposed to 49.0 percent of plays in Big Ten play. Their nonconference opponents, similarly, have passed on 50.2 percent of plays against NU but 46.5 percent of plays in their seasons overall. Coach Pat Fitzgerald admitted to adjusting his thinking against Akron along those lines. “My thought was, if we were going to win this football game, and it felt like we were getting a little bit of a shootout, we needed to go score a touchdown,” he said. The problem with that strategy is that passing-heavy shootouts are not the Cats’ forte, not the recipe they generally follow to win, and not advantageous except as a desperation measure — late-2000s Texas Tech this NU team is not. The decision against the Zips to forego a field goal try to instead go for it on fourth-and-three that Fitzgerald was describing, for example, turned into a pick-six in the other direction. 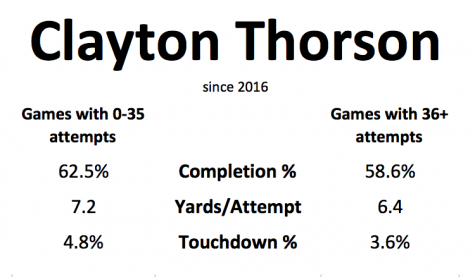 Senior quarterback Clayton Thorson also has an extensive track record of playing worse when tasked with a high volume of throws, much like a baseball pitcher nearing triple-digit pitches. Bad offensive line play and losing track of the running identity have maligned the Cats in nonconference play, but in spite of all of it, NU has still — as it should — created more scoring opportunities than its opponents. We can analyze scoring opportunities as possessions that end in “plus” territory (across midfield). In those last eight nonconference games, the Cats have averaged 7.6 scoring-opportunity possessions per game, while opponents have averaged 6.3 such possessions. In Big Ten play, both NU and its opponents have averaged an equal 6.9 such possessions per game. 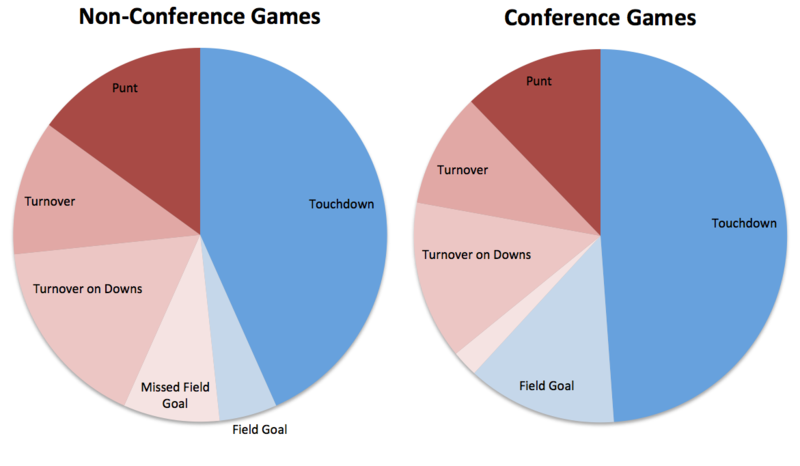 All of that makes sense under the assumption that conference games should be more challenging. But this is where things really fall apart for the Cats. In conference games, NU has scored on 61.8 percent of scoring-opportunity possessions while holding opponents to scoring on 50.8 percent of theirs. In nonconference games, however, the Cats have scored on 47.5 percent of scoring-opportunity possessions while allowing opponents to score on 56.0 percent of theirs. 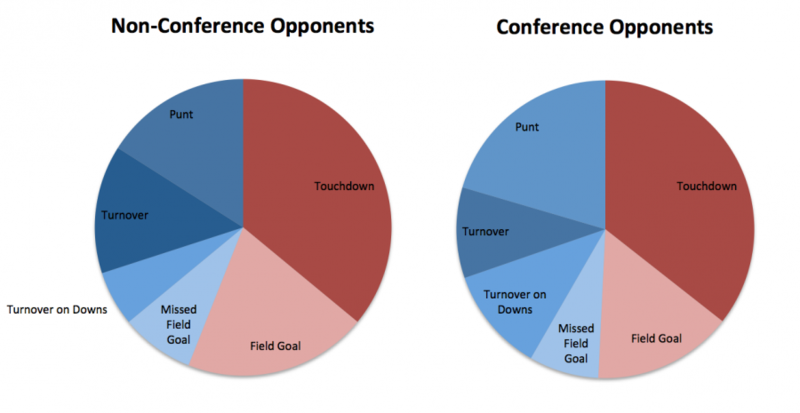 The defense has been marginally worse against nonconference than conference opponents. But the offense has been dramatically worse, which is even more problematic. Five missed field goals in those eight games are not the offense’s fault, but seven turnovers and 10 turnovers on downs are. All in all, they’ve averaged 3.1 points per SOP in nonconference play versus 3.8 points per scoring-opportunity posession in conference play, a befuddling trend considering nonconference defenses — especially those of the Cats’ far-from-treacherous opponents — are generally weaker than Big Ten defenses. That pattern has really reached a peak the past two weeks. “We’ve just got to finish drives,” Thorson said after the Duke loss. But then the Akron game happened. NU crossed midfield 21 times in those two games combined — their 11 scoring-opportunity possessions against Akron, in fact, tied for their most in any game over the past three seasons — yet scored only six times. That’s an average of merely 2.0 points per such possession. They turned the ball over on downs a whopping seven times out of those 21 possessions, by contrast. It’s not clear whether that extreme inefficiency is a result of the aforementioned problems, other reasons or simply a lack of focus and killer instinct. It is clear the Cats are doing well creating a surplus of scoring opportunities yet failing to translate that surplus onto the scoreboard. For all of NU’s distressing variety of offensive issues in nonconference play — for all of the offensive line’s perennial disorganization, all of NU’s ill-advised eagerness to stray from their ground-game ways and all the drives stalled in No Man’s Land between the 30- and 50-yard line — there’s no question that bad luck has also been a factor. Close game record tends to regress towards .500 over time in football, although Fitzgerald is one of few who has somewhat bucked that trend in a positive way during his time coaching in Evanston. Score differential is more indicative of quality of play — and in those eight nonconference games, despite losing five, the Cats are plus-18 in points. The Notre Dame game Nov. 3 should be an intriguing test of whether NU’s recent nonconference struggles are because of the nonconference opponents themselves or simply because nonconference games usually occur at the beginning of the season, when NU has yet to find its groove. Regardless, next year’s slate of Stanford, UNLV and Massachusetts should presumably — emphasis on presumably — feature at least two wins and a regression to the luck mean. Yet that’s not to say the Cats won’t have a long checklist of things to fix entering next September, hoping to reverse a concerning pattern of inexcusable nonconference struggles that by then will have dated back three calendar years.